Every penny raised by our members and supporters goes to helping AMEND to provide information and support to patients and families affected by MEN and related endocrine tumours and to fund our various research awards into the MEN diseases. If you are organising an event, let us know as we would love to share your news. We have free t-shirts or baseball caps available for all fundraisers. Keep scrolling down for other resources. 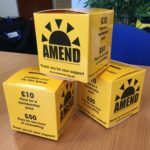 For any inquiries about fundraising for AMEND, please contact Helen Blakebrough in the office. Please sponsor our individual fundraisers if you can. From sponsored tattoos to marathons, their support is vital to our success, survival and available research funds. Thank you to all the wonderful people and their generous sponsors who have supported AMEND by fundraising since 2002. Like and keep an eye on our Facebook Page for the latest sponsorship opportunities. To go to AMEND’s Virginmoneygiving page Click here. Did you know that whenever you buy anything online – from your weekly shop to your annual holiday – you could be raising a free donation for AMEND (Association for Multiple Endocrine Neoplasia Disorders)? 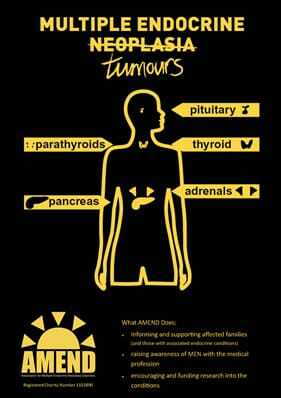 There are nearly 3,000 retailers including Amazon, John Lewis, Aviva, thetrainline and Sainsbury’s, who will donate a percentage of the amount you spend to AMEND (Association for Multiple Endocrine Neoplasia Disorders) to say thank you for shopping with them. 3. Get shopping – your donations will be collected by easyfundraising and automatically sent to AMEND (Association for Multiple Endocrine Neoplasia Disorders). It couldn’t be easier! There are no catches or hidden charges and AMEND (Association for Multiple Endocrine Neoplasia Disorders) will be really grateful for your donations. We are registered with fundraising event organiser, Discover Adventure. Please click on the company name to view the full range of events they offer on their websites. From the Thames Path Challenge to Cycling in Cambodia! Virginmoneygiving provides a non-profit fundraising website with whom AMEND is registered. It is simple to use as an online tool for your own fundraising endeavours. 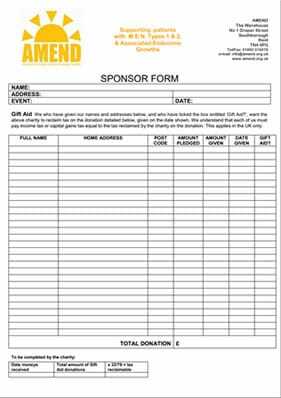 You can set up your own event fundraising page linked to AMEND, or set up a page for in memorium giving. The following forms will be useful to anyone raising money offline. 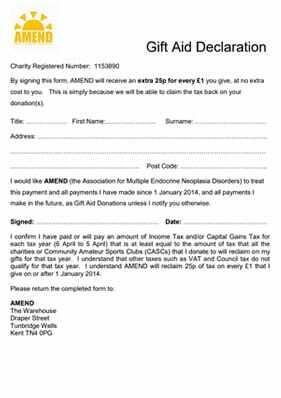 UK tax-payers can complete the Gift Aid form enabling AMEND to reclaim extra funds from the Government at no cost to yourself. These cute, bright cuboids (8cm squared) can hold a deceptively large number of coins and are great for all that nuisance change that gets left around the house or in the washing! Order up to two at a time for free from our shop. You can play for as little as £1 per week. 50p of every £1 you play is guaranteed to go straight to AMEND once you select us. The remaining 50p will be used to provide prizes and cover administration costs. 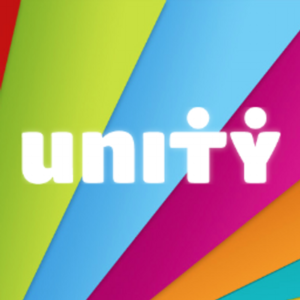 For just £1 per week you will be allocated with a six digit Unity Lottery number, which will remain yours for as long as you wish to keep playing. You can purchase more than one number if you wish. Every Saturday, the lucky winners are selected at random and prize cheques issued and posted directly to you, so there is no need for you to claim. You must be 16 or over to enter. Winners have to match 3, 4 5 or all 6 digits of the winning number in the correct place in the sequence. Use our eye-catching explanatory poster to really draw attention to your fundraising event! Order hard-copies from the office.